This is the eastern border of the cemetery area after several tillings. The soil was predominately clay so to lighten it and provide better drainage, we added peat moss, organic matter (leaves from last fall), a few cart loads of sand and a top layer of compost. 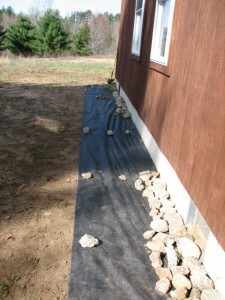 After tilling those in until they were quite well mixed, we turned in some rocks of various sizes by hand. After that, we hand graded it with rakes and created a gentle slope away from the house, instead of it sloping a bit in to the house as the contractors had left it. Why they thought that was a good idea and then then gave it a sharp slope downward further away from the house is a mystery that will likely never be solved. Grr. Anyway, after many hours, we fixed it. One of my prime goals in creating this Gothic cemetery is for relaxation. With lots of writing projects on tap and deadlines, weeding is very low on my priority list 🙂 So, to help eliminate the need to weed, we installed weed barrier and added rocks because – if you haven’t already guessed this – I like rocks! There are pros and cons to using weed block, each gardener has to assess which outweighs the other for them. For me, living with some of its downfalls is well worth it for us. More than likely the contractor may of had it sloped originally but the excavated area around the foundation will settle, it is quite common for this to happen. As for the clay, I think its mostly sand, though it may be fine. On that side they didn’t bother – it was dipped in like that after they left. 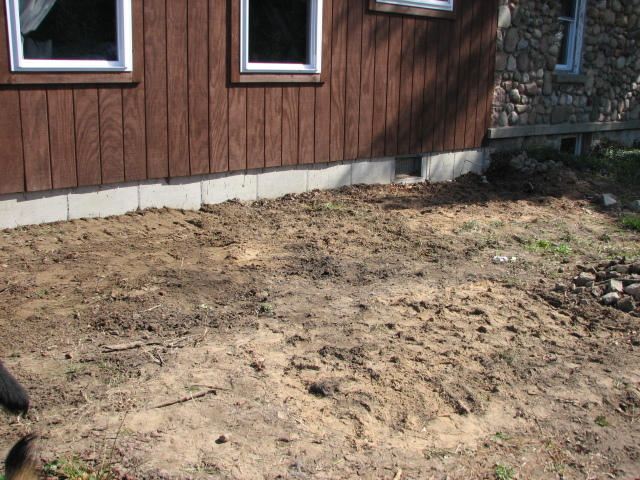 They did however spend a lot of time raking & grading the spots we’d immediately see – the east and north side of the addition area. The west side, nooope. 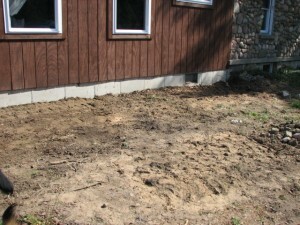 Some of the area is sand but a lot of it is clay dug up from the where they installed the crawl space. 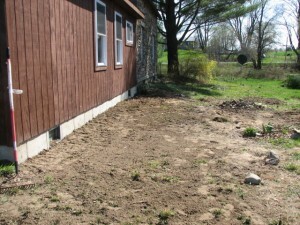 I’ve had to take some spots out completely and dump it out back because it got so darn slippery when it was wet.